We are gearing up for the first day of classes at Brebeuf Jesuit. When the bell rings at 8:15 on Tuesday morning, students and faculty will find themselves in Year 2 of our 1:1 BYOT program. Taking time to discern how any technology initiative fits into the mission and values of the school community is key. We took 3 years from idea to pilot to full implementation. Having a learning objective to frame academic activity and technology initiatives is a good thing. We used a classic backwards design process. Professional Development can no longer revolve around teachers watching as a trainer performs "follow the bouncing mouse" large group instruction. 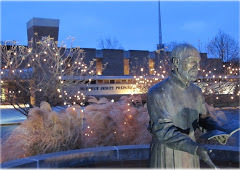 Those of you of the Jesuit persuasion and lovely followers of this blog are familiar with the Context-Experience-Reflection-Use- Evaluation model (Ignatian Pedagogical Paradigm for any new readers). We are in a year of Use. After lots of experience and reflection moments, we are living the reality of BYOT. But as much as we talk about "Verbs not Nouns", empowering students, moving away from teacher-centric teaching, new furniture and classroom layouts... mostly what people want to talk about this August is distracted behaviors. All that ed tech theory is all well and good until a 15 year old plays Temple Run in the back of the room - distracting herself, her neighbors and eventually the teacher. Discussing distractions in the learning environment is a good thing... but let's not kid ourselves... it's not new. Puttering around on Google Scholar this weekend, I found articles (all behind paywalls...but that's another post) on students daydreaming; the evils of Tom Swift and other adventure series; the ball point pen; radio; comic books; television; video arcades; the BetaMax/VCR/DVD... and the cellphone/tablet/Internet. Pretty sure you could plot the course of human history by looking at what distracts us from the reality in front of us. One of my favorite lines from the abstract of "Why Do Children Watch Television" by Eleanor E. Maccoby (1954), "The study reported here was an attempt to discover whether highly frustrated children seek active fantasy lives by spending more time watching television." So just as we teach students how to tie their shoes, wear their bike helmets, use "words not fists"... it's time to intentionally teach strategies for dealing with electronic distractions... 'Cause they aren't going away and marketing campaigns are intentionally focused on making sure we stay distracted (and don't get me started on social bots in todays NYTimes! Wow!). Turning in electronic assignments? Where? Accessing electronic textbooks? Where and how and for how long? Communicating between classmates? Which platform? Guidelines for engagement? All these questions and more need to be asked, answered and written out in the course expectations document. This is old school communication of expectations folks and it is as important today as 50 years ago. Even CNN Living has been covering the empty threat concept lately. One thing kids are really good at figuring out is which teacher is consistent with cause-effect situations and which teacher yells and does nothing. If the ramifications for turning in an assignment to the wrong dropbox is posted "lost points for late work" then make sure every student, every time. Students (especially those new to the learning environment) will succeed if given practice with expectations. Take handing in homework electronically.... practice the first week (in class) using the dropbox. Maybe week two is "give some room for error" week. The week 3 the policy of lost points for late work arrives. Students, just like adults, need time to practice new habits to ensure success. Speaking of new habits, organizational skills are learned. Guide, practice, mentor, model. Parents are your best ally. Remember though, most of them (myself included) went to school in the days of the 3-ringed binder. Parents want to support their student... but if they don't understand the expectations and process the entire support network falls apart. Use the device as a reward toy and that's all it will be. I cringe at stories of elementary students allowed to use their classroom devices only when "their schoolwork" is done. This type of tech as prize reinforces tech as toy thinking. Day 1 that device is for the work of learning. Model with your own technology use that this tool can open the world (parents this goes for you too)... and occasionally reach the high score in Bejeweled. I argue the days of desks in neat rows with a teacher at the front are over. Move the furniture to encourage collaboration. Put yourself in the middle of the excitement and move around! It's another classic but proximity still encourages attention and focus. If you are interested in reading more ideas... here is a list of articles I shared with Brebeuf faculty last week. Round table discussions will begin on the 20th to share ideas, practices and reflections. I'll be sure to share what we talk about!